rule creator variable "part select of ..."
Rule creator loose save and synced rules!!! We are currently working on some major changes on Rule creator and most of the suggestions will be implemented. It could be nice to be able to store rules templates ? First for ourself and then to share with every one? 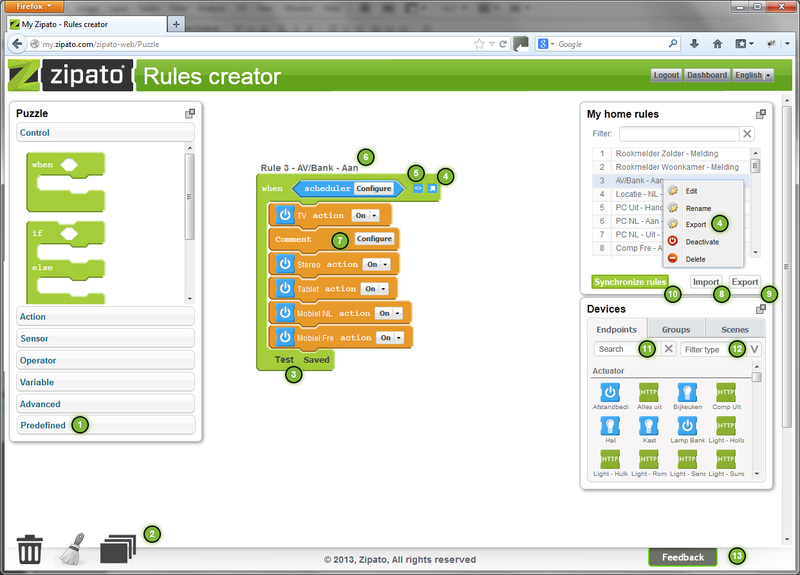 Rule Creator playground (and maybe emulator) to the Zipato community forum. I think rule themplates would be a good start. Easy for people to start using the system. Templates, import end export of rules! Could not see anything like the rule creator on Jeedom home page.....??? But strange that this things get asked time and time again and it does not get implemented? Something similar I was asking when I was new to Zipato??????? A lot of good points, did you realize this was posted 2 years ago. undocumented features ?.... Where can we access to the Java code window ? I like very much the Advance Device Manager ! Al this ides is brilliant I can't understand why Zipato have not implemented them all. Your design is beautiful ides is simple but powerful. When it was so long ago this ides is suggested, and still not implemented I wonder how long it will take to implement other ideas more advanced ides. Like tracking of your habits and suggested rules for your habits and so on. This things will also save the team tremendous amount of time of suport. If there hade bin predefined rules when I started wit Zipato maybe I would have saved my self and the forum and the team hours and hours of work! Implement this as fast as possible Zipato and you will save the team a lot of work for new users. These are excellent ideas. 1) and 3) can sort of be done using "subroutines" that are triggered with a virtual switch. 2) Can sort of be done by first ensuring that the rule you want to copy is saved, then dragging out its contents to a new rule, and saving the second rule. Then clear the workspace without saving the first. Kludgy, but it works. I got this tip from someone else on the forum here, can't remember who just now! 4) This is basically the backup everyone has been asking for. It's essential. I dread the day that I'm told something has gone wrong and I need to recreate all my rules. And for sharing it would be obviously be a big time saver. 7) Comments are really important as rules get bigger and more complex. 11) Where am I using this switch? Do I need it? When you've got 70 rules, search would be useful. Tip for 11: Drag the device to the 'My Home Rules' and there is a filter of all the rules using this device. 2: When you copy building blocks, you also copy the ID of the block, so it can happen when you change some contents within the block in one rule it is also changes in the other rule, for example contents of a http requests. 11) I tried dragging a device to "My Home Rules" but I couldn't get this to work. When I drag anything from "Device Browser" I get a new panel opening up on the left, and that's the only place it will let me drag it. If I drag to "My Home Rules" or the "filter" box, nothing happens. 2) Ahh. That might explain something that's been happening to me with email blocks. So that implies that this copy method is really a bad idea.